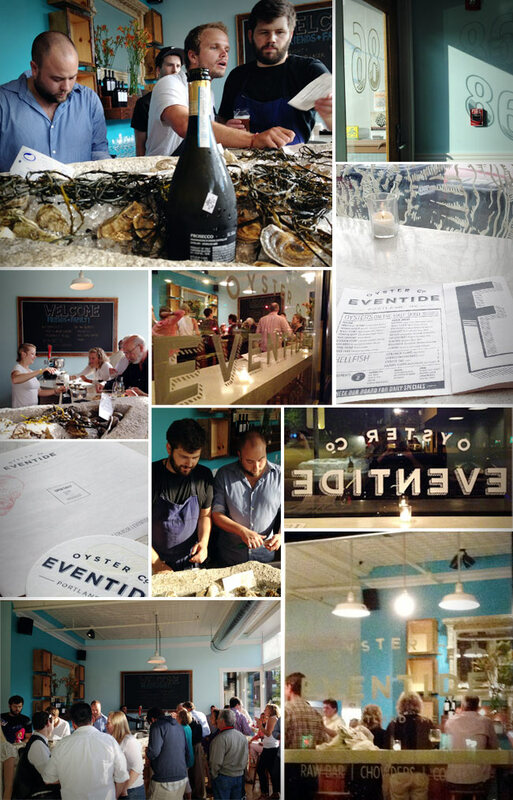 Last night, we were honored to be included in a special sneak-peek party at Eventide Oyster Co.. The Eventide / Hugo's staff was joined by friends, family, and a seeming who's who of the Portland food scene. It was great to see the restaurant community supporting the guys in their new venture, to catch up with so many friendly faces and to make some new connections. The space at 86 Middle Street looks beautiful—the final decorative touches are 95% complete—and the food amazing. We were unanimous fans of the lobster roll with its springy, buttery, steamed bun-like bread, and the tiny, meaty, briny Kumamoto oysters. And of course, it was wonderful to see all of the bits and pieces of branding and collateral that we've been working on for the past several months finally come to life. Thank you, Arlin, Andrew and Mike for including us. We had a great time welcoming Eventide Oyster Co. into the world!